If you’ve read our Glossary of Italian Cooking Terms, you’ll know that the term ‘in zimino‘ refers to a whole class of dishes in which the main ingredient (usually seafood) is braised in spinach or swiss chard. And perhaps no dish represents this class better than this one, calamari in zimino, from Tuscany and Liguria. There are myriad variations of this dish, as we’ll talk about in the Notes. For today’s post, I relied mostly on a recipe offered my old standby Florentine chef and food historian Giuliano Bugialli, with a few adjustments to suit my personal taste. You might be surprised at the combination, but the sweet earthiness of the greens perfectly complements the brininess of the mollusk. And don’t be shocked at how long the greens cook for. They are meant as a kind of ‘sauce’ so it is perfect fine—intended, in fact—that they break down a bit and lose some of their bright green color. What the dish may lack in bright colors it more than makes up for in taste. There is a reason this unusual dish has become a classic of the Italian repertoire. Prep the greens: Blanch the Swiss chard or spinach in boiling water until just wilted. Drain, squeeze dry and chop roughly. Set aside until needed. Prep the squid: While the aromatics are cooking, cut the bodies of the squid into strips or rings. And cut up the tentacles if they’re large. 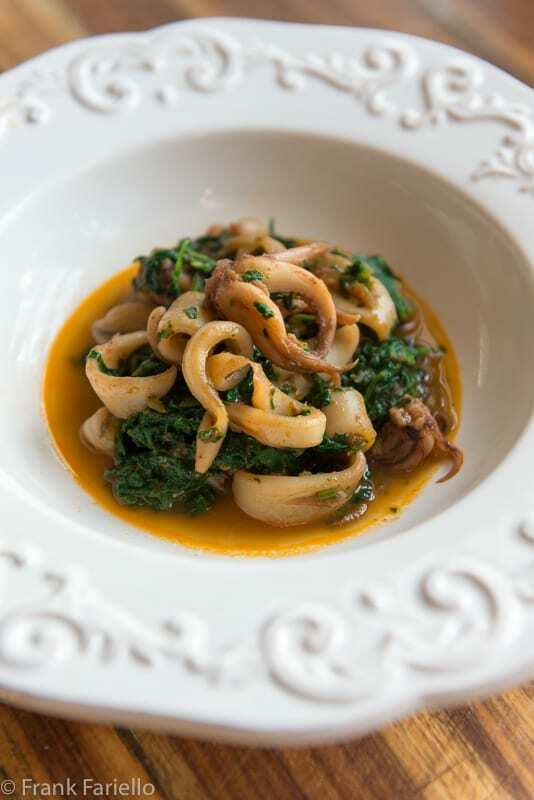 Sauté the squid in the soffritto: Add the squid to the soffritto and let it sauté with the aromatics for a few minutes to allow them to become infused with their flavor—to insaporire, as the Italians call it. Add the tomato paste (and the red pepper flakes if using) and let simmer with the liquid for a few moments to blend. Serve hot, with toasted slices of good, crusty bread on the side. Although the essential ingredients and basic technique are constant, the variations on this recipe are practically endless. While all recipes begin, as is the Italian way, with the soffritto, some recipes (like this one) will have you sauté the squid in the soffritto, while others have you add the tomato first and reduce it, as if you were making a sugo. Still others have you add the greens first, then the squid and tomato. And measurements vary pretty wildly, too. A plurality of the recipes I’ve seen call for a 1:1 ratio of squid to greens by weight, but others call for a bit more squid than greens, others a bit less. The components of the soffritto also vary widely. It is very common to include carrot, but personally I find its sweetness off-putting when combined with seafood. In some recipes you don’t chop the garlic with the soffritto but add it separately, whole, and removed before serving. (Many non-Italians are surprised, but Italians are often quite discrete in their use of garlic, and this is a typical way to use it.) At the other extreme, some recipes will call for a soffritto of only garlic and parsley. Parsley is sometimes omitted, too—although a number of recipes, including Bugialli’s, call for adding generous chopped parsley at the end, a minute or two before serving the dish. The dish is also made with seppie (cuttlefish) and totani (so called ‘shortfin’ squid)—and indeed cuttlefish is probably more common than squid—but squid is what you can find more easily in US markets, so squid it is. If you do use cuttlefish or larger calamari, you will probably find that they need more simmering time, up to an hour (or more) if they are very large. As mentioned, the greens are typically Swiss chard or spinach, or a combination of both. I used a store-bought bag of a mixed pre-washed baby chard, spinach and kale. It worked very well. In some recipes, like Bugialli’s, you don’t just wilt the greens but parboil them for a good 10 minutes, which may be a good strategy if you are using more mature greens. But since the greens will be simmering with the squid for a good 20 minutes or more, I wonder if it’s needed unless the greens are very old and fibrous. In some recipes you add the greens raw to the same pot instead of cooking them separately. While I’m usually all for one-pot dishes, in this case I thought the better of it. Greens are so bulky when raw and reduce so dramatically when cooked that I thought it would actually be simpler to cook them separately. But if you do opt to add them raw, chop them up roughly beforehand and then let me reduce in the pot before proceeding to the braising step. The type and amount of tomato vary, too. I’ve included tomato paste here, following Bugialli’s lead. But most recipes call for fresh tomatoes, chopped or milled, or for passata. The amount varies, too. This version, like most, is only slight red, but some there’s almost as much tomato as greens, as well as versions in bianco. The pinch of red pepper flakes is a recommendation that I didn’t personally take. I find the flavors of this dish pleasantly delicate, and I didn’t want to upset the balance. The odd term in zimino is an old one with uncertain origins. Giordano di Pisa used it in his 1304 Libro della cura delle malattie (Book for the Care of Illnesses) to mean a seasoned dish. Some speculate that the term comes from the Arabic word samin, meaning something rich or buttery. Others think it is a corruption of cumino—Italian for the spice cumin. (I suppose on the theory that the dish originally included that spice?) In a contrary vein, others say the word derives from old Genoese azimin, meaning ‘unleavened’, applied loosely to mean unseasoned or ‘lean’ in the Catholic sense. And finally, some speculate that the Croatia town of Gimino (Žminj), called Zimino back in the day, lent its name to the dish. So bottom line, no one really knows where this term really comes from. And the term zimino itself is used with variations. These include a zimino and all’inzimino, or the single word inzimino as a noun, as in inzimino di seppie. Cephalopods aren’t the only things that you can cook in zimino. You can prepare other seafood, including firm-fleshed fish apt for brasing like eel, carp and baccalà, this way. In Liguria, they also make snails in zimino. In the wintertime they make chickpeas in zimino, an idea which reminds me of the Neapolitan cicoria e fagioli. And the Sardinians around Sassari make a totally different dish—grilled lamb or veal innards—which they call zimino. Go figure. Blanch the Swiss chard or spinach in boiling water until just wilted. Drain, squeeze dry and chop roughly. Set aside until needed. While the aromatics are cooking, cut the bodies of the squid into strips or rings. And cut up the tentacles if they're large. Add the squid to the soffritto and let it sauté with the aromatics for a few minutes to allow them to become infused with their flavor, to insaporire, as the Italians call it. Add the tomato paste (and the red pepper flakes if using) and let simmer with the liquid for a few moments to blend. This looks very delicious, Frank! Seems very challenging for me, but I would love to have this for dinner with a glass of white wine! Sending you lots of greetings from Athens! Didn’t know there was a similar Greek dish—there seem to be so many such parallels! Such an interesting post Frank with all your notes on preparation. I’ve not had or seen this dish at restaurants so I’m happy you shared the recipe with us. Worth a try, Karen. Thanks for stopping by! And I’m happy you stopped by, Karen! I made this for dinner tonight. It was excellent! I’m a sucker for calamari and this hit the spot. I added some clam juice, as suggested by Jim, and I think it makes the dish. I did add red pepper flakes, but I won’t next time; they tend to overwhelm. This would go well served on pasta. Adding some shrimp, scallops and a few whitefish chunks would take it to the next level. Thanks Frank! That’s fantastic, Brian. So glad you liked it. I agree about the red pepper flakes, by the way. And given how many dishes can be made in the “in zimino” style, I’m sure that a seafood combination would be great. Well this was a new dish on me, Frank. I hadn’t heard of “zimino” before, but rather was thinking of pinzimonio – a whole different animal. Anyway, I love squid, swiss chard and/or spinach and look forward to trying this. Frank, did you study with GB? I ask because I did and he often gets lost in the avalanche of new cookbook authors and Italian food professionals. This is an absolutely delicious and comforting dish, the epitome of Italian cuisine. Your are a wealth of information, I so enjoy reading the tremendous background material you provide. Thanks Paula. No I’ve never had the privilege of meeting the man, but I am an avid reader. I agree he doesn’t get the attention he really deserves. As a source of knowledge of Tuscan food and its history he is second to none. Beautiful dish, Frank! When I read your glossary of terms last week, one of the few I didn’t know was “zimino.” I love calamari, and look forward to trying this beautiful dish. Frankly, I discovered “your place ” last week (shame on me) but there are so many wonderful things to discover again since they all bring be back to the years of my childhood. And again, molto felice di trovarti ! Keep on with your beauties ! All the best ! Ah Frank, again I thank you for your dedication to your blog. Friday mornings before I plan the day’s dinner I anticipate your next suggestion. And tonight’s meal at my home was of course calamari in zimino. In the small Florida town I live in, fresh calamari is pretty much not available –frozen is all there is: thawed frozen at Christmas, but I’ve never seen fresh. To make up for the frozen squid, when preparing the meal tonight I did add a bit of clam juice to the mix to add a bit more briny flavor. All I can say is wow … what a flavorful and wonderful dish. Thanks Frank … your recipes inspire me! Please keep your recipes coming! Thanks, Jim! It’s awesome to know that you’re enjoying the blog and especially that you’re using it to cook from. That’s the highest compliment a reader can give us food bloggers! I am a big fan of squid and always look for new ways to cook it. This braised squid dish sounds fantastic! I love the balance between the seafood and vegetables. I recently made a saffritto to flavor my ramen soup base and I was seriously addicted. I can’t wait to try this soon! Thanks. Thanks for stopping by, Yi! If you try this out, do let us know what you think. Braised squid is wonderful stuff. This recipe comes at a good time for me — lately I’ve been thinking about squid dishes, specifically long-cooked ones. Quickly cooked squid is wonderful, of course, but I think the flavor is better in braised dishes. Haven’t had it with greens before — love the idea. And red pepper flakes would be a necessity for me! I see you’re a chilihead like my dad. And me, much of the time. Depends on my mood! The tale of where these terms come from and then ending it with “no one really knows” just made me smile! So Italian! This looks comforting and light – a rare combination. Getting decent calamari that isn’t rubbery is a challenge here. Loving the idea of braising in greens. Thanks Claudia! It’s too bad that squid is becoming less and less available for whatever reason. Although—as I’m sure you know— one needn’t worry too much about the “rubbery” part if you’re braising. Just let it go longer until it gets tender. I love Bugliali! He’s a maniac. A beautiful seafood dish. Thank you for all of your hard work writing these posts. And thank you for your comment, Mimi! Note to self: Pick up calamari to make Frank’s Calamari in Zimino. Sounds delicious and I can think of some delicious slices of homemade Italian bread to act as la scarpetta to soak up that yummy juice. Buon weekend. Yep, that bread is the best part! Buon weekend anche a te! Honestly, I’d like to avoid the blanching step. The dish would work perfectly in a pressure cooker, starting at the “braise” stage, just after you mix in the greens. I would try 10 minutes at medium pressure (just a guess) and see how that works. As for blanching the greens, as mentioned in the Notes, it’s not essential. You can add them, raw and roughly chopped, and let them cook down before beginning the braise.